This map is by cm|b4IkLu and myself (cm|Chris_0076). It has been in progress off an on for a while now. It is based off of Donya Fortress from the Close Quarters expansion pack for Battlefield 3. Some parts are more like the BF3 version than others, and some parts are just made up. The main difference is we decided to not have the map destroyed like its BF3 counterpart. 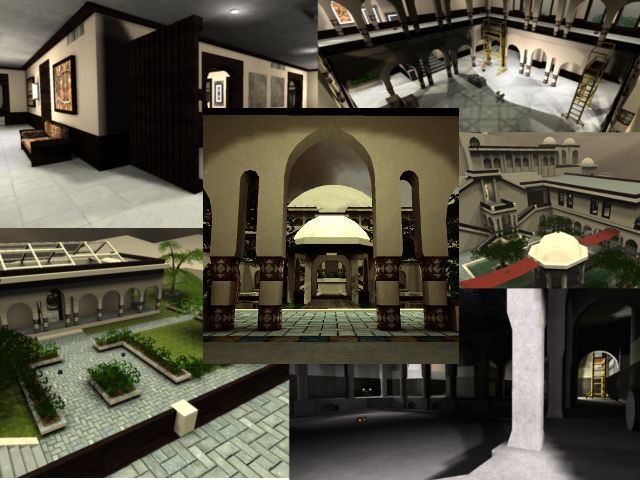 There have been many iterations to this map and a few of them can be seen here: http://cubicmatter.net/forums/viewtopic.php?f=8&t=643 That link also includes some of the older screenshots of the map from before we started cutting stuff out to save wtr. The map weighs in at 201k wtr, and it seems to run fairly well on most computers. and everyone else from Cubic Matter. -The textures are well used and the details are good. -The geometry is lacking of some volume, some walls are too flat and small, wich is pretty visible (example, both of the ctf bases, in the limits of the playable part of map)one base more than the other looks too like a squarish room, btw this is a minimal problem that can be fixed easly adding details or closer buildings. The other place that i didnt like too much is the middle of the map, not the structure in the middle, i mean all the zone, looks too square and a bit open, spammed and flat, the copy pasted arches and wooden details on the walls looks good, but yu should add atleast 1 diferent detail in the middle of 2 of that wooden things, and add also something to the front of the arches, so it will not look so plane. -The layout is pretty simple, a bit entangled, bit i think it can be easy to learn, some corridors are a bit narrow, but the rooms have the enought space for the gameplay of sauer, the flow is pretty good, The layout in the middle is open, but not enought for campers, also some parts are too long corridors wich is not good for the gameplay. -Theres a hole that have terrain textures, it looks like a square, you should fix that texture making the hole more circular. This map is nice, pretty playable, i liked it, but there are some problems that needs to be fixed, i give to your map a 7/10 "awesome", you deserve it and if you fix all that problems i probably will change it to a 8, you two are improved editors, Chris and b4IkLu, good job!. I updated the map and the changes are listed. The ammo placements are still terrible, but I don't know anything about placing them... so yeah. Maybe I will get some more time to look into placing them better later this week. This map looks great. This should be in the next cube release. I said so on IRC that I would leave a comment on it, so I do now. The screenshot looks pretty and clean. It shows off the map in it's original appearances, which is good. The packaging of the map is also just fine, nothing to say about. The them seems to be urbanic, which is being expressed very well. I still miss some broken details, even there are several places which seem to be under construction. The texturing is fine, except some few points. Please don't make me sue you for having a high specular light on the floor1 texture within the nieb folder, as in some cases, it gets amplified due the very bright lighting in several rooms. It really hurts your eyes when looking down even a little bit. So I would suggest lowering the specular light which is being emitted on the texture, or putting the brightness of those light-entities a bit lower. A very good example to show which rooms I am talking is the hall which contains 2 construction platforms and a construction lamp. The geometry is already somewhat efficient, but could be way more than it currently is. The inside geometry of the large roof which has the shape of a bowl could be skytextured, so less light-maps would be created (be sure to put skytexture 0 and skytexturelight 0, else you would get ugly lighterrors). The same counts for that roof which is in that garden surrounded by pools. Several arches in the cellar also could be skytextured from the inside. Skytexturing the surfaces outside the map (which aren't in sight when ever being on the playground) is a very good solution to lower it's file-size and it's wtr also (as 7,5Mb for a map, that's a no-go to me). The lighting is pretty overbrighted, as the roof of that building in the middle of that garden surrounded by pools shows off. Seriously, one day, I'm going to sue someone for making me look at surfaces which are potential hazardous for your eyes. Just don't overbright man. Every heard of the entity spotlight? I think it would do a great job at those construction lamps, as you're currently trying some wacky work around which isn't necessary at all. Just place a bright light-entity but with a small radius very near the actual lamps of the detail and a light-entity with a (way) lower brightness but a (way) higher radius just a little bit further away from the lamp, compared to the light-entity with a smaller radius (1 unit of the smallest gridsize is enough already). Then place the spotlight some units further away from the light-entity which has big radius and see the magic after calculating the light. After testing, I noticed putting the lightprecision to 64 makes the map be 4Mb in file-size, which is still damn big. The detailing is fine. Some details could be less wtr consuming (like all wooden doorways). The shape of those wooden doorways is a little odd also. It looks too flat at the upper arch to match the side arches (I would recommend to make it more geometry-efficient also, as it contains pretty much triangles for just a doorway which is being used all over the map). Several details have been overused (like those construction lamps), but I can't blame you for that. It's a large map which already contains more details as an average map of that size. The clipping in overall is pretty good, but when talking specific, it's pretty bad. Those construction lamps are overclipped, as somehow you can't even reach the feet of it, neither the actual lamps. It makes it appear very unrealistic. The flow isn't bad, but that's because all hallways have been made just very wide. It's a cheap and easy way to create a somewhat proper flow, yet it isn't challenging at all. The gameplay isn't bad, but not that great also. Only 45 playerstarts which are divided into 3 different kind is a pretty low amount for such sized map, so be sure to put some more around. There are several places which seem to have no purpose at all (like the inner and outer garden which is team good's base). It has only 3 riflerounds, 3 bullets, 2 shells and 2 cartridges as pickups, over an area which a map like douze would fit in twice (I've measured it and yes it does fit). So the pickup placement is pretty much of a mess, which I recommend to improve greatly. The map shows off that there has been putted a lot of effort to make it look good, but just a little to make it actually playable. Keep it up and lower it's file-size (and wtr! ), turn the lighting some less bright as it currently is and fix those playerstarts and pickups. I'll rate it 7/10 for now (it's trying to reach to an 8/10 though). I tried skytexturing all the unseen parts, and it did not change the calc time, but it did save about .1 Mb so that will be added when I get around to having enough time to do it all. Those are actually an intentional hack because with a spotlight I would have to use 2 lights instead of just 1 to do the same exact thing. With a spotlight the insides of the lights would be black. While the 2 light solution would work, I just find it to be more trouble than it is worth. Yes, the clipping for the spotlights will be fixed in the next update. 45 playerstarts is actually a lot. It ends up being at least one for each room as well as a few for the larger rooms. In non ctf versions, and in ctf versions it is a nice distribution excluding the center rooms. I have no doubt that the ammo is terribly placed, I also will admit that I don't know how to properly place it. For one I don't use ammo (mostly playing insta when I do play) and I don't fight that much. Anyways, thanks for the comments. Maybe I will get some time later this week to fully flesh out the changes seeing as how I will be very busy early this week. I had no problems at all with the mapsize, but oh well fine to me ^^. Nice to see that you're experimenting with skytexturing. I know it's a pretty slow and boring process, but it pays off in the end. The benefit of using a spotlight is that you have way more control over what will be lightmapped and what not. Using geometry so a light-entity stops "hitting" a certain surface isn't very accurate most of the times as well. Here's a screenshot about the what I actually meant with the spotlight-entity. Beware, I've used lightprecision 128 to calculate the lightmaps, as I'm not willing to wait 20 minutes or so before it finally is done calclighting. Clipping the outsides of the map isn't a bad suggestion also, as PVS culling (Potentially Visible Set) has been intregrated somewhat into the remip- and lightmap-calculating process (at least, that's what me is being told once). As Cube Engine 2 won't calculate clipped surfaces when generating PVS culling (or anything like that), it's not bad to do so (and it's a quick and fast move to do anyway). I'll look into the gameplay (and pickup placement as well) to make it better. Maybe I'd have some suggestions for it. I forgot to mention on my previous comment; what about some textureblending on the grass? It's pretty plain right now. Maybe some textureblending on the concrete surfaces also (or even on the floors that carry the floor1 texture)? It can't be mopped and cleaned everywhere. Also textureblending the start of the cave isn't a bad thing I guess. Nice to see the mapmodels used this well. They're positioned like they should have been positioned. Feeling like a dwarf when navigating around the map is no problem at all. Pretending to be a midget, that's what you actually should concern. Great job guys. Another awesome map. The map looks nice and since Bf3 is a great game I guess the playability would be great in Sauerbraten too. Problem is that I feel like a dwarf walking around on that map, every structure in this map is overscaled and way too big for me to feel comfortable. Made a few updates to the map. The ammo still needs fixing, but I think it is closer to being done.